We have heard our fair share of speeches. Some good, some bad. Since that is one thing we do not do as a wedding planner, we wanted to do a blog about how to make a great speech! 1. Don’t tell mother-in law jokes. There will usually be one or two mother-in-laws present and you could spoil the day by offending them. You never know what people will consider funny so it’s safer not to tell such jokes. 2. Never tell smutty stories. Take a warning from the photographer who caught on video the father of the bride thumping the best man because he had spoiled his daughter’s wedding by giving a blue speech. The bride was crying in the background. Smutty stories are not suitable for an occasion where there is mixed company particularly on a day when people are particularly sensitive. Besides there may be clergy present or elderly people who would be shocked. 3. Forget the groom’s unsavoury past. Best men are often tempted to tell stories about what the groom has done in his wicked past. It might offend the bride though and it is safer to mention some incident where he lost your luggage on vacation or knocked you out in a friendly football match rather then mentioning his success with other women. 4. Never thank the hotel staff. They are paid to do this job and you don’t thank the florist the chauffeur or the photographer for doing their work. If they do a good job send a letter of thanks or recommend a particularly helpful employee to the management if you wish. 5. Don’t give away family secrets by mentioning a sore subject like alcoholism or gambling. 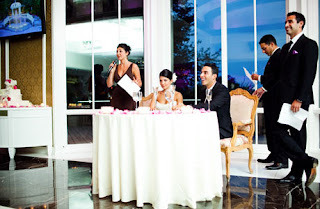 Weddings speeches should be gracious and positive. 6. Never talk about previous marriages. This is a new start for the couple and past marriages should not be mentioned. If the children of a previous marriage will be present check with the couple whether or not they should be mentioned. 7. Forget saying “And now I wish to thank" and then give a long list. If there are people to be mentioned they should be woven into the wedding speech by saying something warm-hearted or witty about them. 8. Never say something that someone else will be saying. The father of the bride traditionally toasts the couple for instance. If you are acting as best man or speaking in another capacity you should check it with the couple as to who is giving the toast to the bride ad groom. 9. Always check before mentioning a deceased family member. Some people might find it too sorrowful for you to do so on what should be a happy day. 10. Don’t go on too long. A good wedding speech is about content not length. Thank you to StreetDirectory for this great article! Your Perfect Day.....because you deserve it! Your Perfect Day is here to help you plan & coordinate the details of your wedding - so you can sit back and relax. We can help you with the small things and the big things. We can help you with a few details or all the details. We can help make your dreams come true and everything in between. Just think of us as your best friend. You can tell us anything - and we'll listen. - Complete wedding planning - Last minute wedding needs - Coordination of the rehersal & wedding day - 2 hour consultation to help you get started - Chair cover rentals - Wedding invitation, program & thank-you card design - Decor of your wedding or reception - Someone to bounce ideas or concerns with - Consigment shop to rent or sell your wedding items. Your Perfect Day....because you deserve it!